This read-a-thon is the perfect excuse to start out the new year with a bang! It runs from January 5-11. 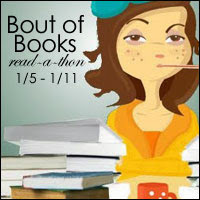 Check out the Bout of Books page for more information and sign-ups. Hubs is leaving on a business trip soon, and I'm still recovering from a nasty cold, so I plan on chilling on the couch, listening to audiobooks while I work on my very neglected blog, and then curling up with the pups and knocking out a few more books from the list below.